The tale of Martine Wright MBE 7/7s most injured survivor is truly an astonishing one of triumph over adversity. Martine Wright MBE lost both her legs in the Circle Line bombing yet she considers herself a lucky woman with a whole new life of opportunities. On July 6, 2005 – when London was awarded the right to stage the 2012 Olympic and Paralympics Games - Martine celebrated the historic announcement with her friends. Commuting to work the next day, later than usual, she lost both her legs to a terrorist bomb and began the long, arduous process of rebuilding her life. For everybody in Britain, those two days were among the strangest and most shocking in recent history, for Martine Wright MBE it provided a spring board for new opportunities and goals and a new life! The start of that remarkable journey to the Paralympics began in November 2009 when Martine tried the sport at a ‘have a go’ session for women’s sitting volleyball. She took up the sport for its inclusive nature and focus on team element before quickly displaying the ability to make it to the very top. 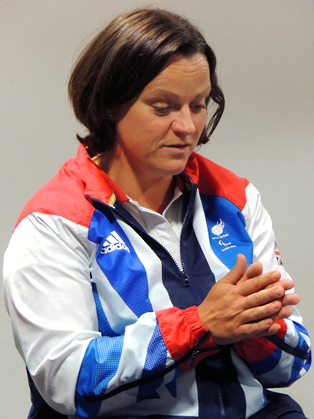 Martine Wright MBE made her Great Britain debut at the 2010 Kent International against the Paralympic Champions China and she has now gained competitive experience of over 65 GB caps. The GB sitting volleyball team took part in their first Paralympic Games at London 2012, just two years after the squad was formed. Martine Wright MBE had the honour of being vice-captain of a team ranging in age from 14 to 42. She chose to wear the number 7 shirt, in honour of the 52 people who died in the atrocities of 7/7. Martine Wright MBE has now accepted the captaincy of the team going forward to the Games in Rio 2016. Outside of the sporting arena, Martine Wright graduated in 1996 with a degree in Psychology and Communication Studies from the University of East London and trained as international marketing manager, she is also a property manager. Since 2006, she has also been a public campaigner for the families of the victims of the 7/7 bombings. In 2012 Martine Wright MBE won the Helen Rollason Award for outstanding achievement in the face of adversity at the BBC Sports Personality of the Year. During November 2013 Martine Wright MBE was appointed to the role of Team London Champion by the Mayor of London Boris Johnson. Team London is the Mayor of London’s volunteering programme which was launched in 2011 to help ensure that volunteering and volunteers were having the greatest possible impact on London’s highest areas of need. In August 2015 Martine was named in the top 50 of the most influential women by the Independent on Sunday's first annual power list. Martine Wright MBE has appeared on many television and radio shows including a Strictly Come Dancing Sport Relief Special. Also in 2014 she was invited to provide commentary and studio punditry during the prestigious Invictcus Games - a role she relished and seeks to develop in the future. In March 2016 Martine Wright MBE presented the BBC Sport Relief "Clash of the Titans" Trophy alongside Jo Brand and is looking forward to more television work in the coming months. 2013 University of East London Honorary Doctorate in Science. Martine Wright is now busy sharing her story , her experiences and what she has taken out of her journey to be a Paralympian and rebuild her life . She has spoken at intimate events of 20 people to audiences in excess of 10000 at Wembley Area and the O2 . She always tailors her presentations to suit the needs of the client. Martine Wright has the ability to interact with a wide range of people and is comfortable in any environment delivering keynote speeches for corporate markets, public sector events, health, charitable and education conferences to sporting awards evenings. For the first time, Martine tells the full story of the day that changed everything and the extraordinary life she went on to live as one of the lucky few survivors of 7/7. Unbroken is her deeply moving and inspiring account of how she not only survived one of the worst terrorist attacks in British history, but turned that trauma and tragedy into hope.